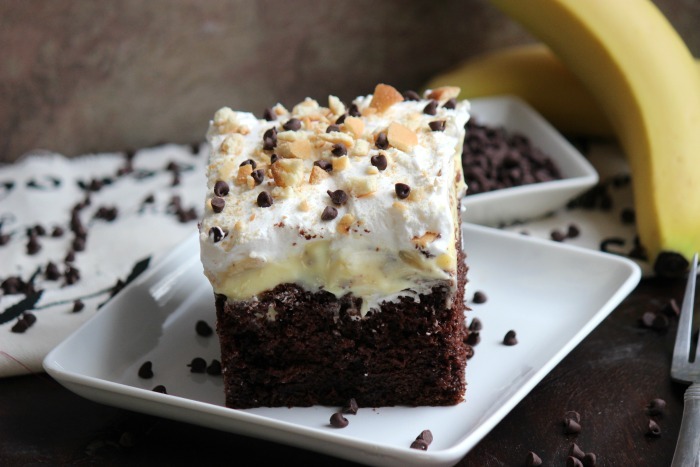 Chocolate Banana Poke Cake is a rich chocolate cake topped with bananas, banana pudding, cool whip and mini chocolate chips! Inspiration can turn up anywhere. For me, almost anything can spark an idea for a recipe; it might be a movie, a photo in a magazine, heck it might be a conversation! Memories spark or an idea jumps out at me and I just have to make it happen! 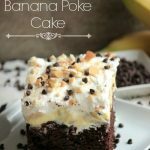 This Chocolate Banana Poke Cake is a great example of a recipe that came to be because of a conversation with my friend Nikki. 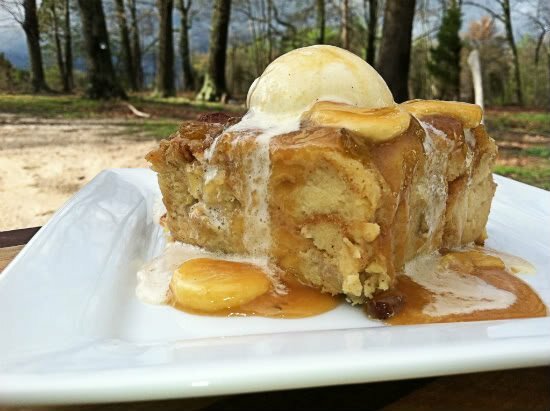 You see, we were walking down the River Walk Trail with her two little girls one afternoon, talking as we normally do, and she started telling me about this amazing Banana Pudding Poke Cake that she had made. She was in love with it and just couldn’t get over how good it was. I had heard of Poke cake before but I’d never made one. (I mean of course I’d heard of it, I’ve seen it all over the food blogger scene before). However, I had never seen anyone in real life make one nor had I even heard anyone in real life talk about one. I was intrigued and I walked along the trail and listened to her as she explained each step that she took when making this “Poke Cake”. It seemed simple enough. I jotted myself a mental note and we continued on with our conversation. As we continued our conversation about desserts I brought up the beloved Eclair and we both agreed that it was amazing and needed to be made ASAP (which it was). Then it hit me! Chocolate! I love Chocolate! I love Banana and Chocolate! I needed to make a Banana Pudding Poke Cake like Nikki made but I NEEDED to make it with Chocolate cake and chocolate chips! I also used Boxed Banana Pudding (Let it out! 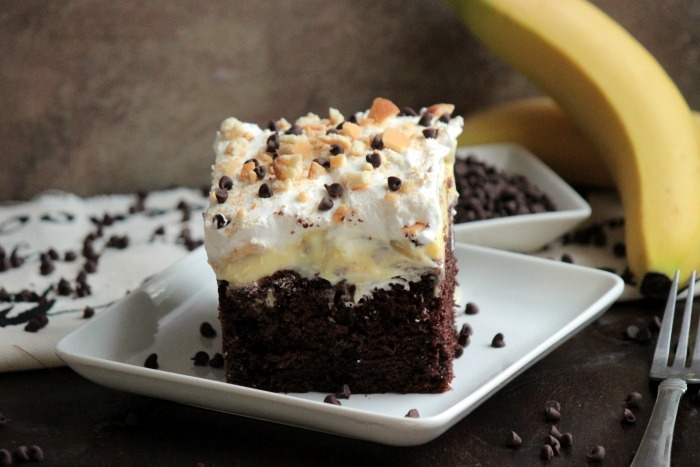 Another GASP) But you know what, if you feel like making a chocolate cake from scratch, I have a recipe here for chocolate cake and if you want to make banana pudding from scratch, I have a recipe for that here (just use the banana pudding part of the recipe)! Now, who wants a slice? In a large bowl, mix the cake mix, water, oil and egg. Beat until smooth. Pour into a baking dish and bake for about 45 minutes or until done. Let the cake completely cool. Once the cake has cooled, use the end of a wooden spoon and poke holes all over the cake. I poked about 30 holes in the cake. Spread the banana pudding all over the top of the cake. Place into the fridge and let sit for 2 hours. Remove from the fridge after 2 hours and place the banana slices all over the pudding. Top with the cool whip. 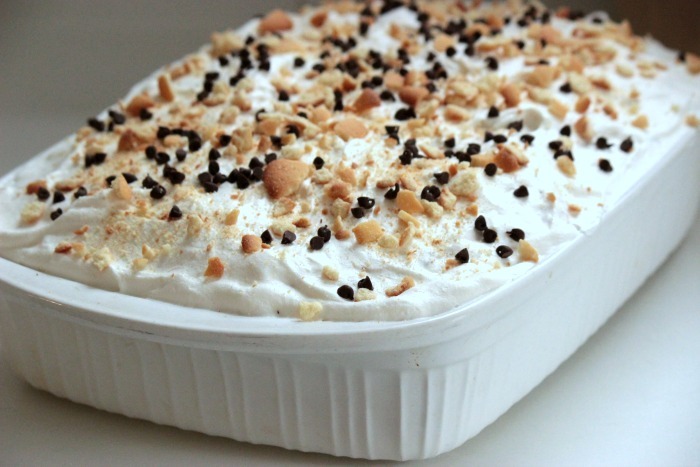 Sprinkle the top of the cool whip with crushed vanilla wafers and mini chocolate chips. Refrigerate until ready to serve! Now I’m in love with Poke Cake! I need some new flavor ideas to try!! Like this? You may like these too! You don’t even KNOW how happy I am to see this cake! It sounds freakin awesome! I really want to just dive in. I’ve never made a poke cake either! I love this chocolate banana version though, much better than that red jello and white cake. Maybe it’s a strawberry poke cake? This is going on my must make list for sure though! I love poke cakes, and this is great combo. 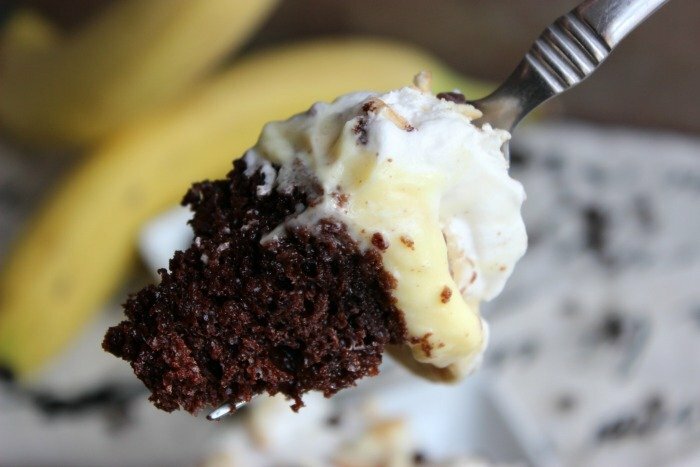 Yay for chocolate and banana- delish! That is just too beautiful to even eat…but then again! 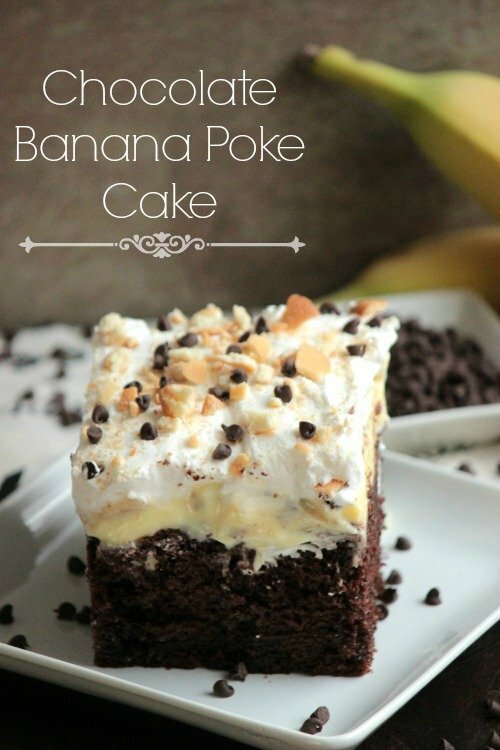 I’ve never heard of poke cake (I’m fairly new to the US) but it looks incredibly delicious!!! 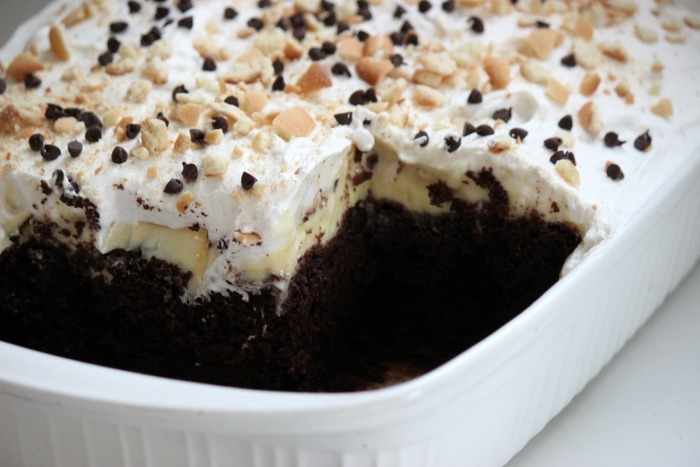 Oh em gee, you’re bringing this to blogher food right….right…right? I love this. I totally have to try this one. Like immediately. We had our first poke cake last month at a church function and my oh my it was fabulous! 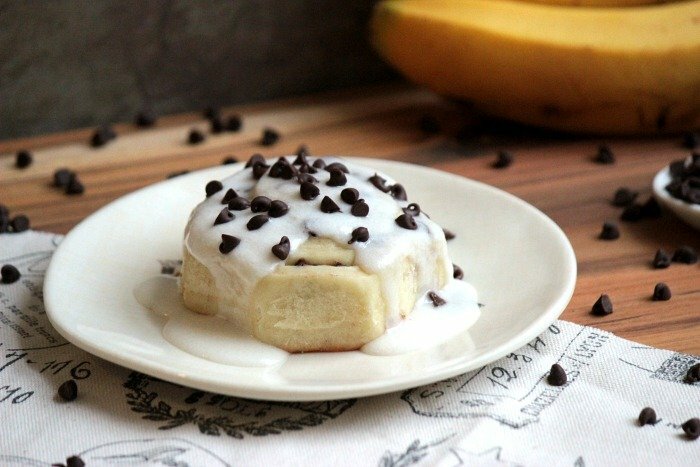 The combination of bananas and chocolate are perfect! 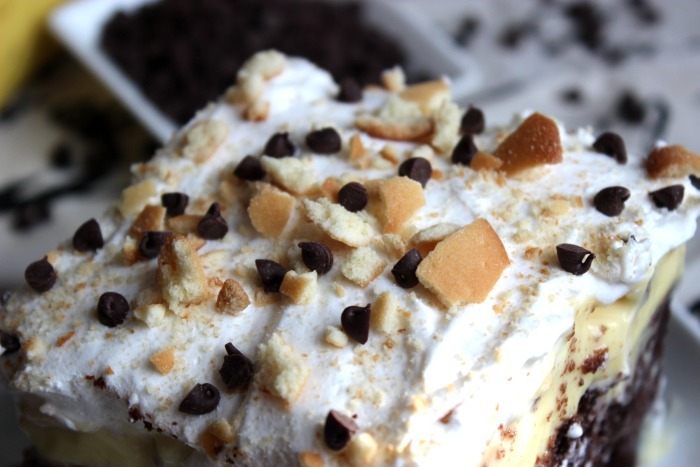 Ummm. . .so I confess I kind of new what poke cake but not entirely! After reading your directions, now I get it! You poke the get for the pudding to soak in. Fabulous idea! I LOVE poke cake! My mom used to make it all the time but it always so basic compared to the flavors I see popping up now. I would have happily dug into a slice (or two) of this when I was a kid! Wowza …. I love poke cake!! 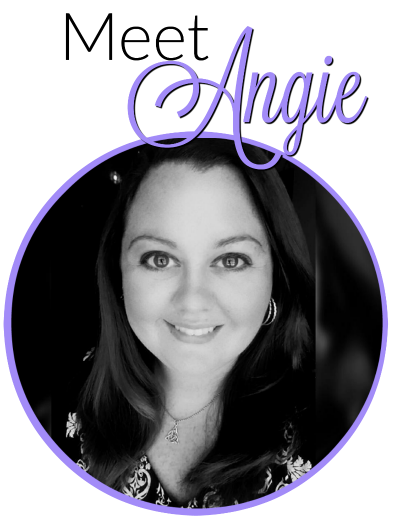 This sounds sooooo good, Angie! 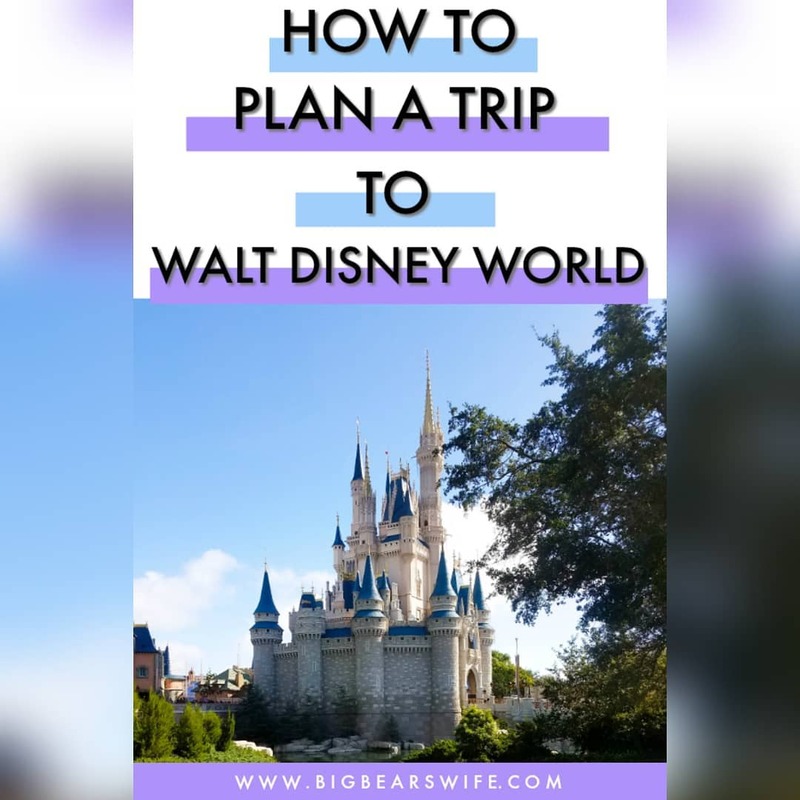 Pinned and scheduled to share on FB! 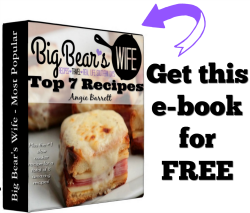 I love your simple recipe and I am not offended with box cake mixes – easier, less expensive and the cake looks gorgeous by the way. Did you put the slice bananas over the cake once the pudding is on after? I don’t see it written anywhere here in this recipe so I’m assuming that’s what you did. I’m going to try it tonight. Thanks for sharing! “Spread the banana pudding all over the top of the cake. Place into the fridge and let sit for 2 hours. The recipe calls for 2 boxed cake mixes, do you use 2 mixes for the large baking pan & just 1 for the 9×13? I wasn’t sure. I don’t make my poke cakes in a 9×13 because I want them to be extra thick (instead of just a thin layer of cake from one box) but If I was going to make it in a 9×13, I would probably cut the recipe in half (so just one box of cake mix), but to be honest, I haven’t made any of my poke cakes in a 9×13 so I am not 100% sure if it will be as tall and thick as the one pictured. 🙂 Please do let me know how it turns out though if you give it a try! 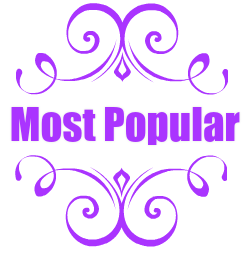 Do you use instant or cook type pudding? 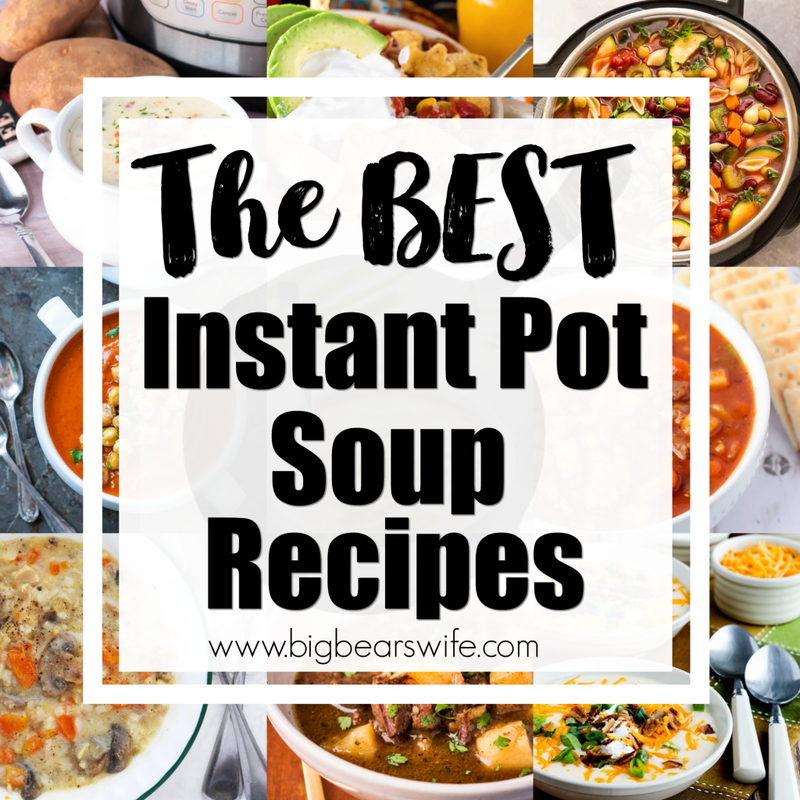 I use instant for mine but you could use either one. If you use the cook to serve pudding, just follow the direction on the box for the pudding. 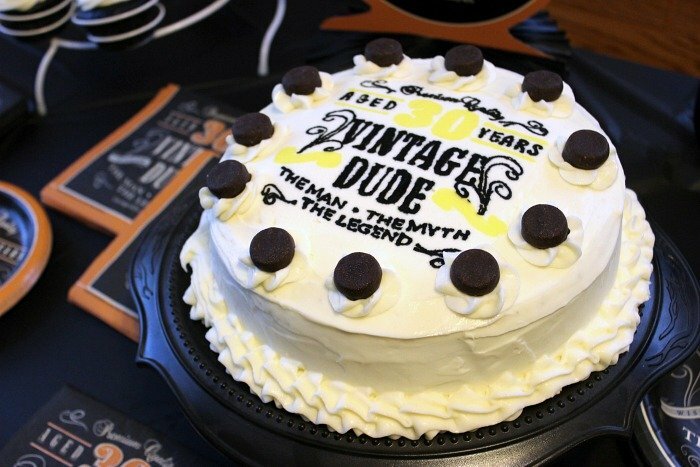 First, I need to say that I just baked this cake for my fiance for his birthday. He LOVED it! We ALL loved it. So good! I used the ultra moist cake mix and the banana cream pudding boxes. Perfection. The leftover pudding and vanilla wafers are also a hit. Process notes: Plan to start this cake EARLY if you want to serve it “after dinner.” It takes hours for the cake to both cool…and for it to set up. I used the 9×13 pan as suggested, but the cake puffed up so tall that the pudding more or less oozed right off of the chocolate cake hill. Ergo, when I make this cake again, I will either use an 11×13 pan, or leave out some of the cake batter, so I am able to serve it with a thicker layer of pudding on top. (What a mess as I watched most of the pudding ooze off all sides…a yummy mess, but a mess… ) I also used a regular sized tub of whipped cream, so no need to buy the mega tub if you don’t have one handy. Or, better yet, make your own! 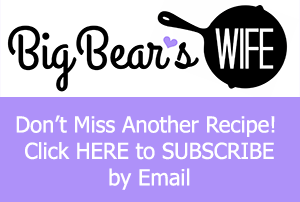 You can find many wonderful recipes online. It’s just sugar/syrup/honey, heavy whipping cream (cold) and a little vanilla. Thanks, Angie! Sooooo gooooood! I think chopped peanuts would also be a nice add-in. ooo I think that would be great too! Hey Barbara!!! So glad that y’all loved the cake!!! It does take a little while for the cake to cool and for the pudding to set 🙂 haha. Oh my gosh yes, if you used the entire recipe in a 9×13 it would totally spill off the sides. The 9×13 suggestion is for if you’re going to cut the recipe in half. I use 11 x 16 x 3 inches casserole dish for the entire recipe 🙂 I went back into the recipe and made that part bold just now so it’s easier to see 🙂 If you make it in the 9×13 you only need the small container of cool whip but in the 11×16 pan I needed the large tub to get the thickness that I wanted. 🙂 Again, so happy that y’all love it!! It’s one of our favorites!